When it comes to outrageous German sleeve designs, it's impossible not to mention the first Eulenspygel album. It presents a half-burned chicken lying in a frying pan. This really disgusting design (by Wolfgang M. Schmidt) upset so many people that the cover was withdrawn. If you have wondered why Eulenspygel named their first album 2, it was because they also counted the album issued under their previous name Royal Servants! Their first album was recorded at Studio Maschen, Hamburg, July 1971, and produced by Wolfgang Schmidt and Peter Springer. It offered a typical German progressive blend, drawing equally from heavy rock, folk, jazz and classical. The six tracks were cleverly arranged, with rich instrumentation and sudden shifts of tempo. All lyrics, containing anti-war messages and other critical political views on different aspects of society, were in German. Inside the fold-out cover there was a Black Sabbath like shot of the band at a graveyard, burying a chicken! 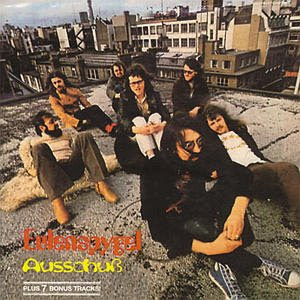 Since the burnt chicken sleeve had caused controversy, Ausschuss (1972) was issued in a plain corrugated paper sleeve! It was recorded at the Apple Studios, London, in April 1972 with the same production team. Musically this was quite similar in style to their first album, but in my ears not as good as this. Mellotron and moog were used as well as organ and piano. The magnum opus was the 22 minute "Abfall", which went through innumerable changes in mood and melody. For some reason, the band then disappeared from the scene.